Early-diverging land plants have relatively simple morphologies and structures, but they have a strong ability to adapt to terrestrial environments. Previous studies have shown that lineage-specific genes played an important role in the adaptation of early-diverging land plants, but how these genes originated and evolved remains elusive. Recently, a collaborative research led by HUANG Jinling , an investigator from the Key Laboratory of Plant Diversity and Biogeography in East Asia, Kunming Institute of Botany, Chinese Academy of Sciences (KIB/CAS), reported that horizontal gene transfer and innovative shifting of reading frames provided a new mechanism for gene and functional innovation in early-diverging land plants. The gene encoding hemerythrin was horizontally transferred from fungi to the most recent common ancestor of land plants and secondarily lost in most vascular plants and some nonvascular plants. 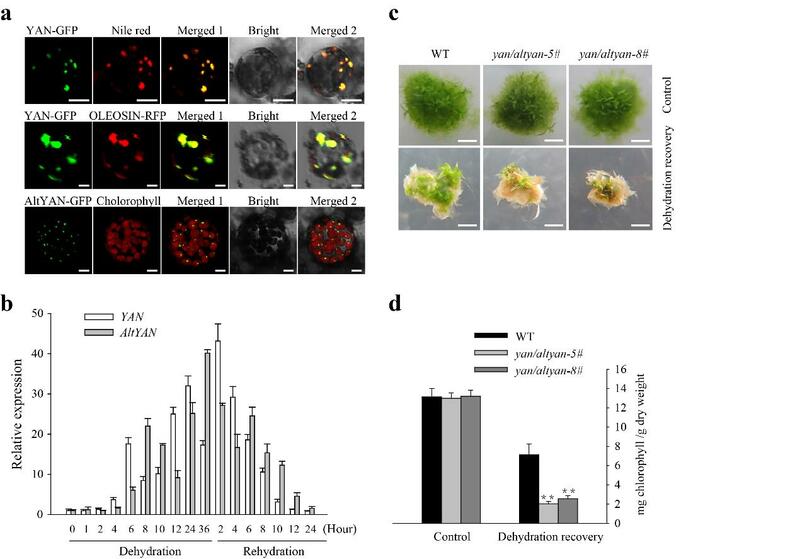 In the moss Physcomitrella patens, the hemerythrin gene evolved into a new dual-coding gene with two overlapping transcripts, YAN and AltYAN, by shifting the reading frames. Molecular genetic and physiological evidence demonstrated that the newly evolved dual-coding gene YAN/AltYAN mediates dehydration tolerance in P. patens through its involvement in various metabolic processes related to fatty acids, oil bodies and waxy crystals. Surprisingly, available evidence suggests that the pre-existing hemerythrin gene was also most likely involved in the oil body formation and drought resistance. This study provides major insights into the evolution of lineage-specific genes in early land plants and their adaptive significance. This work was recently published online in Nature Communication under the title “Gene refashioning through innovative shifting of reading frames in mosses”.（DOI：10.1038/s41467-018-04025-x). Collaborators of the work included researchers from KIB, Yangzhou University) and University of Louisville. This work was supported in part by the National Natural Science Foundation of China, the “Light of West China” program of CAS, Pioneer Hundred Talents Program of CAS, and National Science Foundation (USA).